In the market for a car but cannot afford a new one? 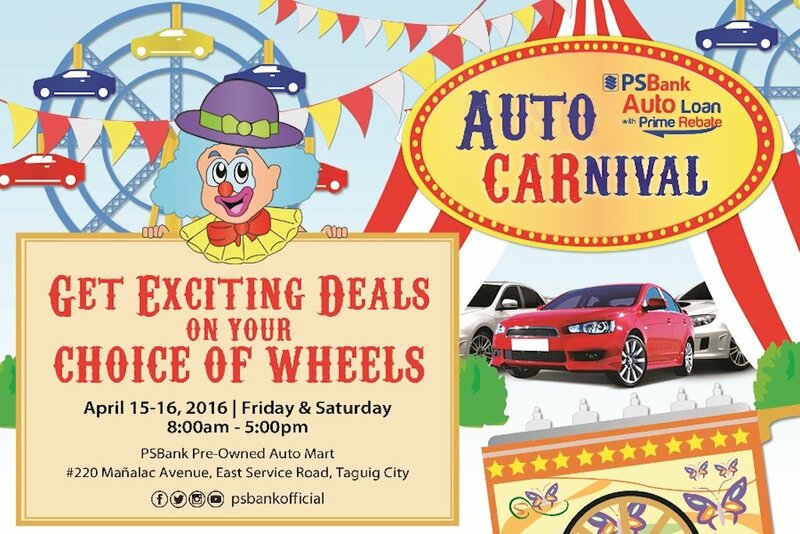 Well, this may be your chance to snag a good deal as PSBank will hold a two-day sale of its repossessed vehicles at its warehouse in Taguig City. Along with discounts, this week’s event will also have freebies and reasonable rates if you’re into financing. Through PSBank’s Auto CARnival, PSBank will open the gates of its Auto Mart warehouse from Friday, April 15 to Saturday, April 16 at 220 Mañalac Avenue, East Service Road, Taguig City. Opening at 8AM and closing at 5PM, clients who purchase vehicles will be entitled to some freebies including P 3,000 worth of gas, P 2,000 worth of tint services, and a PSBank umbrella. To qualify for the freebies, the client must avail of a car loan with at least P 400,000 amount and with a minimum payment term of one year and maximum of four years. All vehicles purchased during the two-day promo should be for private use only. Event visitors will also enjoy free snacks and refreshments to beat the summer heat.